If you’ve been following along with Superman and Action Comics over the past few months, you know that Superman hasn’t exactly been all that super lately. He’s not had his supersuit, he’s been depowered, and had his secret identity leaked. But it’s time for all that to change (back). 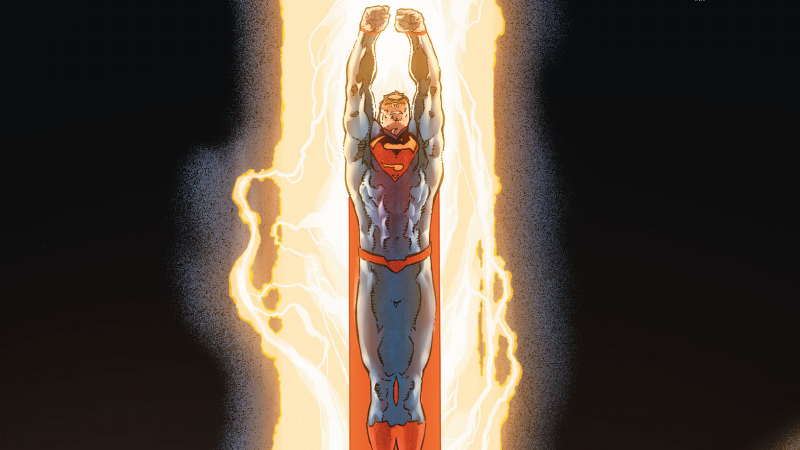 Spoilers ahead for Action Comics #50, by Greg Pak, Aaron Kuder, David Messina, Javi Fernandez, Bruno Redondo, Vicente Cifuentes, Tomeu Morey, Arif Prianto, and Wil Quintana. Action Comics #50 is the culmination of Greg Pak’s “Truth” storyline that’s been running since he joined the Superman team as part of DC You last year—a storyline that’s been all about tearing Clark Kent down physically and emotionally, in order to build him back up again. Unfortunately, he’s made some pretty silly attempts to get his powers back along the way—including wandering into a tank full of Kryptonite—and now he’s also dying from Kryptonite radiation poisoning. So when Superman and his allies take on Vandal Savage to stop his plans to create a cabal of superpowered immortals, he assumes its going to be his final battle. You get your customary team-ups, you get Clark’s support characters chipping in to save civilians, and you get Superman going toe-to-toe with Savage. It’s all to remind that you that no matter what Kal-El has gone through over the course of this storyline, his friends have always believed in his ability to be Superman, regardless of whether he has his powers. During their scuffle, Savage shoots Clark with some poisonous bullets that hasten the damage the Kryptonite radiation is doing to him, and then punts Superman off the edge of the rapidly rising spaceship they’re fighting on for good measure... which is right over the very spiky exterior of the Fortress of Solitude. ...and yes, giving him his suit and cape back. It is, as with every other aspect of this issue, very much a story about the power of faith and friendship, and how that’s never really wavered for Clark and his allies throughout his whole ordeal. Turns out gigantic alien superhero secret ice bases have feelings too! So there you have it: after many months of shaking up the Superman formula, the Man of Steel is back at peak strength and peak Supermanness. Just conveniently in time for, oh I dunno, a certain blockbuster movie to hit theaters.